Special sale for Thanks Giving. Get it for 66% off while we celebrate the holiday. 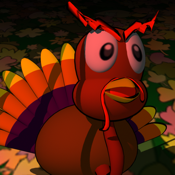 Help Gabos the turkey escape the pilgrims. Roam through their farms and eat all their veggies. When you get sick of veggies... Get back at the pilgrims and chase them too.